InterOcean Advisors LLC presented at the HYDRAULIC CONFERENCE 2012 held in Florida in January. The presentation to hydraulic industry executives highlighted characteristics driving the strong level of acquisition interest in the industry and outlined the M&A multiples being paid for companies in the various sectors of the industry. This diversification of end users makes flow control companies attractive to acquirers interested in consolidating this fragmented market. Product innovation in the primary sectors of the industry is driving higher price points, improved margins and attractive M&A valuations. 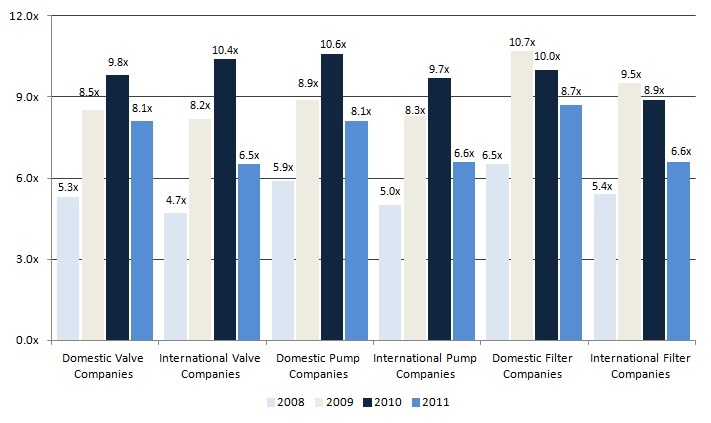 › Pumps – Competition in the pumps segment results in manufacturers seeking more efficient products. In this non technology-intensive industry, this is achieved through use of improved materials and designs. › Valves – Valve manufacturers face high price competition, resulting in new product design and construction. Product development is driven by the growing sophistication of systems which incorporate valves as part of the design. “Smart” valves containing multiple sensors and micro-processing functionality. › Filtration – Filtration products emphasize efficiency, durability, and cost. Conventional products are being improved to perform better for longer. Development of environmentally friendly products to minimize waste is a key focus. Transaction multiples for flow control companies remained robust through the recession, although some retrenchment occurred in 2011. Flow control multiples are consistent with overall middle market M&A transactions, which are also on the rise. The average M&A multiple in 2011 for transactions less than $50 million was approximately 10.1 times. Greater availability of bank debt has allowed private equity firms to increase leverage and offer aggressive multiples for middle market transactions. The average equity contribution by private equity firms has declined somewhat since the height of the recession, when equity contributions averaged almost 50% of transaction prices. Both financial and strategic buyers are poised to pursue deals in the flow control industry. › Private Equity firms have over $400 billion in uninvested capital, which is fueling the increase in significant transaction multiples. › Strategic buyers have significant liquidity on their balance sheets and are able to pay premium multiples for acquisitions to recognize synergistic value. Both types of buyers value the basics: size, profitability, growth opportunities, niche or complementary products, strong distribution relationships, attractive geographic coverage, and certified products.